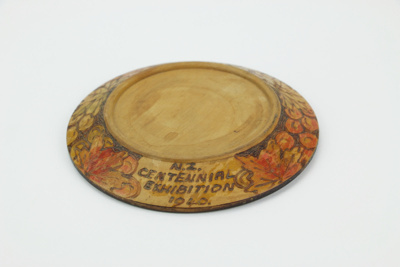 Wooden circular souvenir teapot stand with poker work decorated sides tapering to a bevelled flat, plain surface. The decorations of tree leaves and clusters of round berries or nuts, accentuated with red staining. Produced to commemorate the 1940 New Zealand Centennial Exhibition. After WWI, rehabilitation centres were set up around New Zealand by the Disabled Servicemen's Re-establishment League to teach vocational skills to the disabled servicemen. In 1932 the first of many retail shops in various centres were opened. The goods were branded as label 'Disabled Soldiers Products' and often catered to the tourists market. The handiwork of these soldiers was one of the few ways that disabled servicemen could earn a living. "N.Z. CENTENNIAL EXHIBITION 1940" - poker work text around the edge.